Welcome to the third instalment of our February Focus blog series on coloured flooring. In this post, we look at one of the most visually pleasing and effective colours to use in interior design – black. 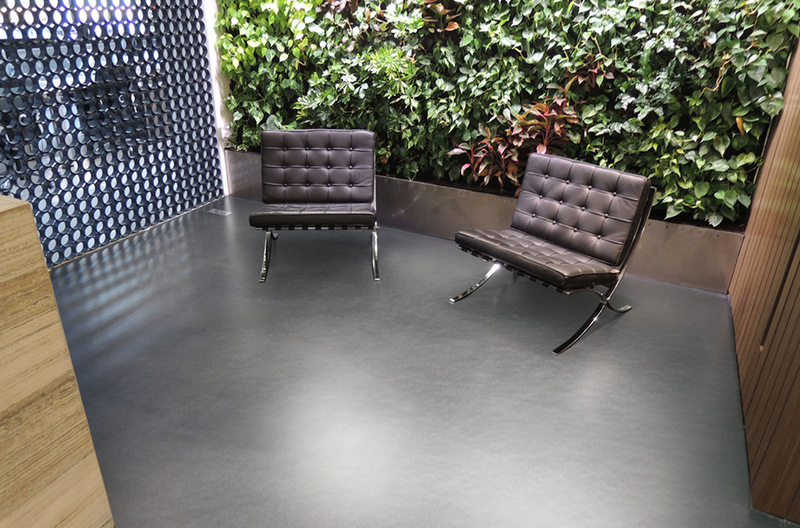 In contrast to our posts on red and grey flooring, black is often found in commercial spaces rather than industrial facilities. Thanks to the flexibility of design in the commercial sector the colour is also often combined with interesting textures to create a particular aesthetic. 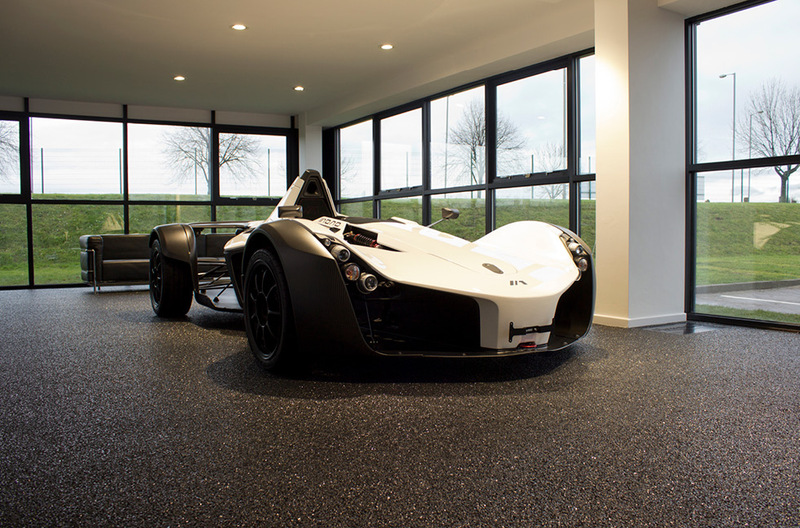 In the car showroom shown below for example, a natural stone textured flooring has been used, possibly to mirror tarmac or road surfaces, adding to an ‘automotive’ aesthetic. In showrooms like this, a great customer experience starts from making a great impression. Creating an air of luxury reflects the prestige of buying a brand new car, and giving the motors a visually pleasing podium to sit upon helps to generate this feeling, whilst keeping the cars accessible to potential customers. 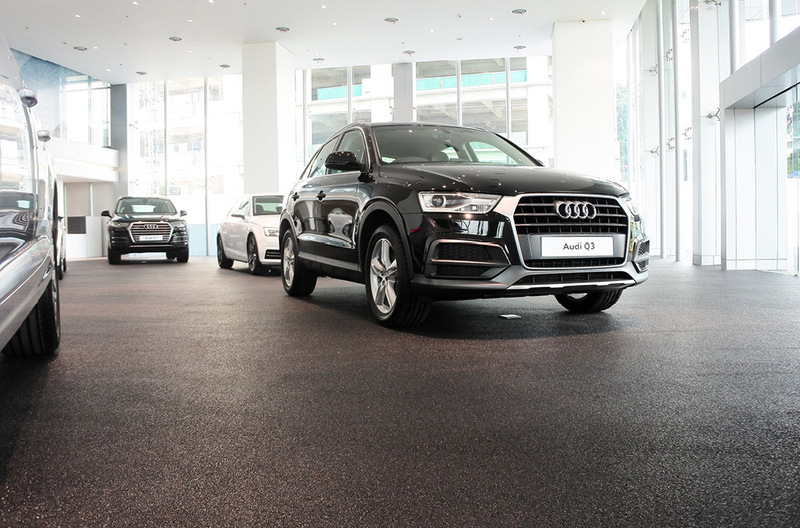 A very similar flooring material has been used in this car showroom as well, but the gloss finish on this textured surface adds an extra element of glamour. 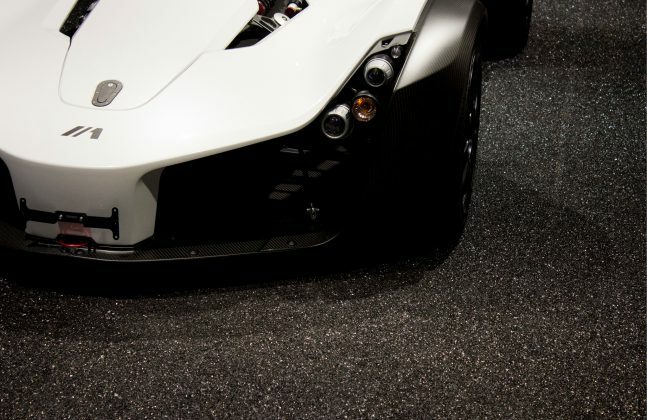 This lavish finish matches the swanky sports car, and gives a very luxurious feel to the environment. Creating a great first impression with high gloss flooring also works very well in offices, especially when the office houses architectural and design professionals. 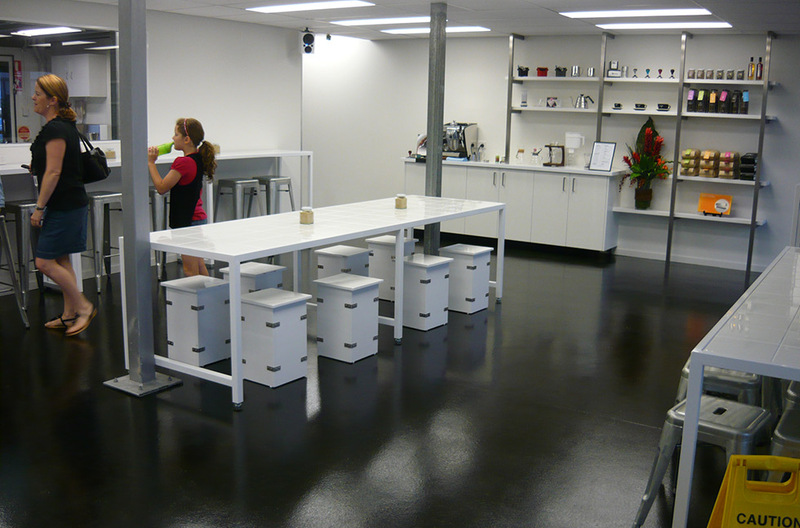 Here a deep charcoal epoxy resin based system was chosen for meeting rooms and personal office spaces. This interesting and bold backdrop is likely to help enhance and induce creativity within the working environment, and possibly provide inspiration to the designers. Vibrant backdrops can also be used to facilitate an impressive welcome. 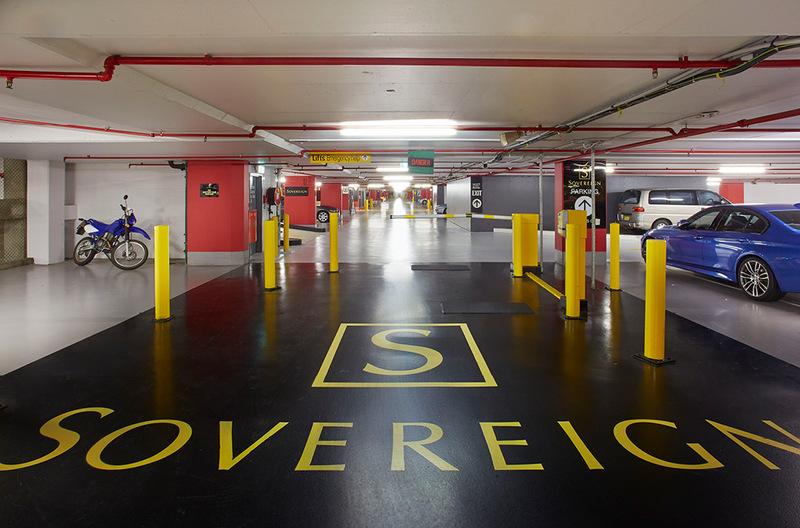 The deck coating at Australian casino Sovereign Room’s exclusive parking zone incorporated a black and yellow logo into the flooring of the entranceway. As well as creating an impressive welcome to the high rollers, this also acted as a barrier, highlighting to drivers that they are nearing an invitation-only area. 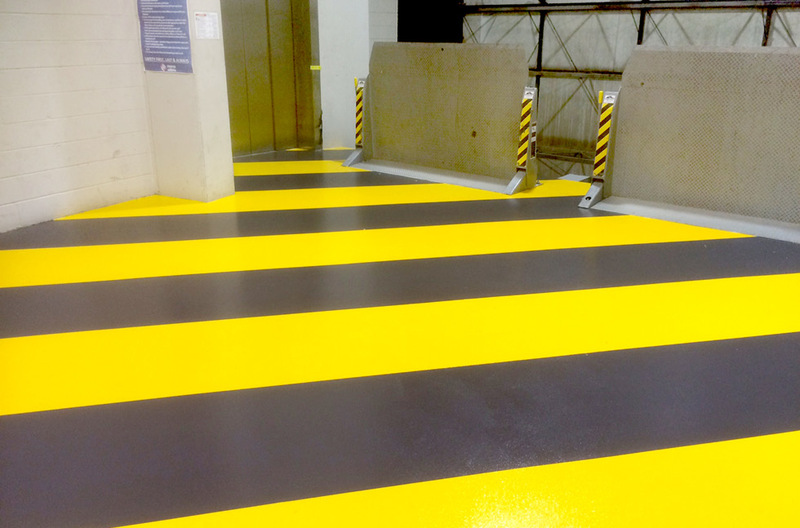 Black and yellow are two colours that we often come across in the world of flooring. If they aren’t being used for a company logo, they are often used to show areas of caution. One place where we are very likely to see black and yellow is on our roads, where yellow lines signal no parking areas. These visuals are not just limited to the outdoors however. 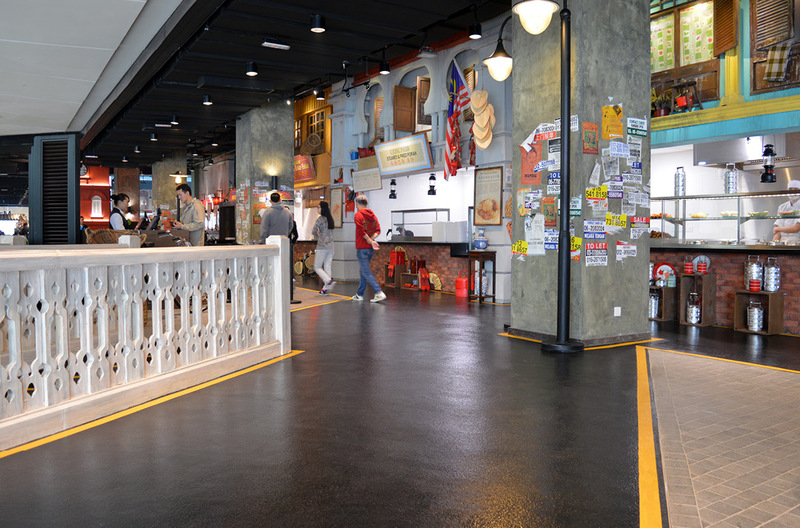 This indoor Malaysian street food market wanted to develop a traditional ‘old town’ aesthetic and chose black polyurethane with yellow demarcation to create the visual of a real ‘street’ food setting. This is particularly effective when combined with the cobble-effect flooring flanking the ‘road’. It is not just the combination of black and yellow that is visually attractive however. More and more we are seeing monochrome designs making their way into commercial spaces. This could be as simple as choosing black resin flooring to contrast well with white furnishings and fixtures, as shown above. Or the design can go one step further as shown below. 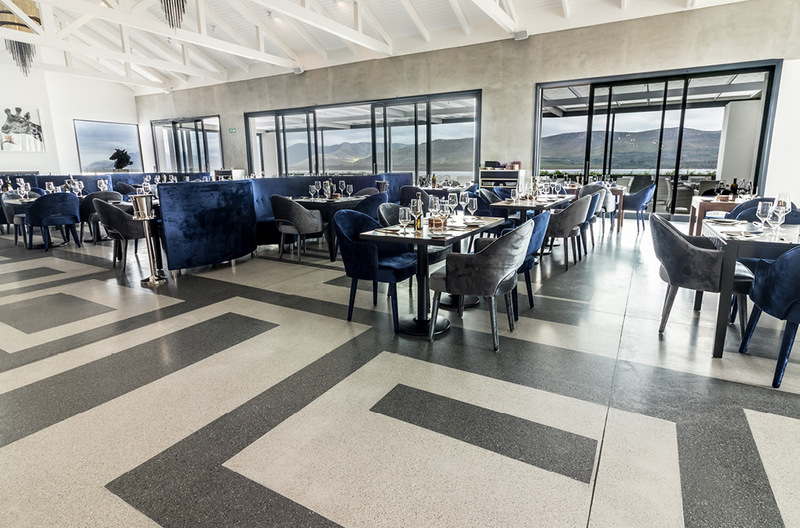 This restaurant decided to match its sophisticated identity with interior design and chose terrazzo flooring in contrasting and complementary colours to do so. The flooring was installed in a stylised pattern of geometric squares, rectangles and lines within the restaurant’s seating area. 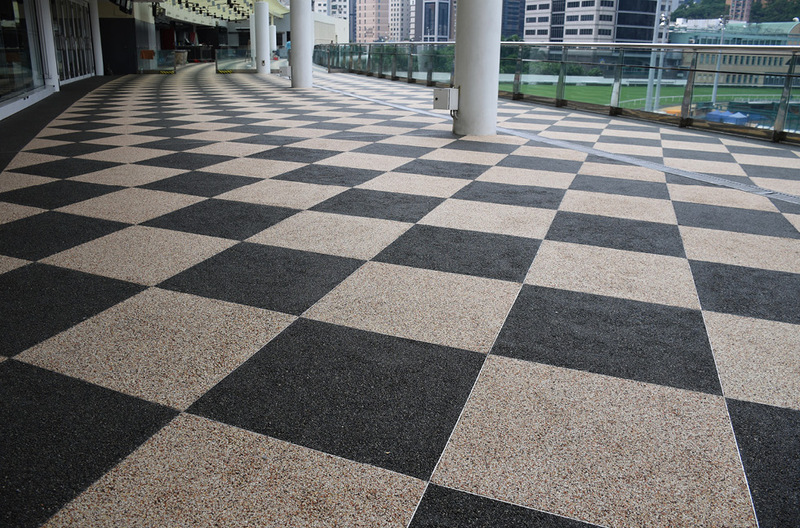 In the same vein, this horse racing stadium decided to install a stone carpet in a black and white chequerboard pattern on an outdoor terrace. As well as being exceptionally visually effective, the pattern is also reminiscent of the chequered flag, most often used to signify the end of a race. So whether you are incorporating a logo, mirroring a real-life aesthetic or generating a bold platform for goods, black works wonders in the flooring industry. Where would you use it?